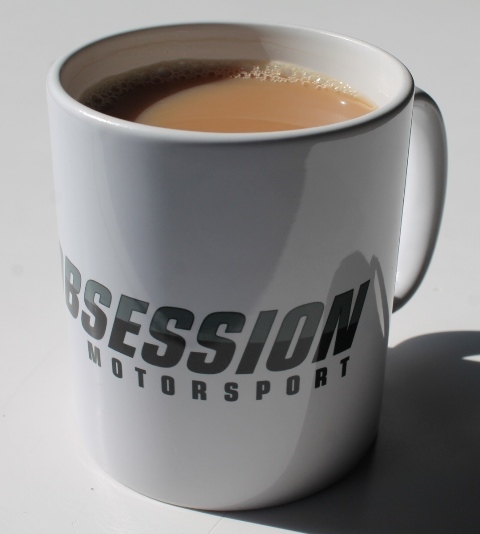 This is the official, limited edition Bad Obsession Motorsport mug. Constructed entirely of some sort of ceramic material, this drinks receptacle can hold up to 330ml of your chosen beverage. It’s finished in something called ‘Duraglaze’; whilst we think this is a made up term, we are reliably informed that this means it will take a whole 2000 cycles in a domestic dishwasher without colour fade. And a whole hell of a lot more ‘quick swill out with an oily finger and some tepid water’ cycles. The C shaped addition to the side of the mug is a handle; a neat addition allowing the user to pick up the mug without 3rd degree burns to the hand from the hot liquid inside. The drinking vessel will take 3/4 of a standard digestive biscuit (digestive biscuit chosen for demonstration purposes only) broken vertically for the ultimate dunking action. The uses of this item are limitless. You can put tea in it, coffee in it, all manner of cold fizzy and still drinks, you can even use it upside down with a sheet of cardboard underneath to trap spiders and other errant insects. The world is truly your oyster with this mug. Watching episodes of Project Binky while sipping tea from your new mug will enhance the viewing experience to hitherto unknown heights. I know what you’re thinking – shut up and take my money! Well, just click on the button below, pay us £10.95 (plus P+P ) of your hard earned cash and we’ll freaking well send you one!